Leela and her husband Madhava were both children of learned Brahmins. They were very devout and in deep love for each other. After several years of married life, Madhavan felt that it was time for them to renounce worldly pleasures and turn entirely to spiritual ways. Leela did not agree to the proposal. She won't let him do so too. The dispute led to a hot arguement. Finally Madhava cursed her to become a she buffelo with devilish disposal. Leela was reborn as Mahishi, daughter of Karamba, brother of Ramban. Mahishasura, Son of Ramban, undertook a severe penance (Dhavam) towards God. Lord Brahma tried every tactics to stop his Dhavam, but having failed in his attempts, appeared before the Asura and asked him what boon he wanted, from him. Mahishasura asked Lord Brahma to give him a boon by which nobody in the earth would be able to kill him, and Lord Brahma conferred the Boon on him. Mahishasura, armed with this boon, began to commit atrocities and murders on the earth and terrorized people. Fearing his wrath, people ran away to far away places. The Devas,seeing the atrocities committed by Mahishasura came to the conclusion that only a divine power could kill him and approached Chandikadevi pleading to put an end to Mahishasura who was misusing the boon given by Lord Brahma. Chandikadevi set out on her mission and killed Mahishasura in a duel, on the earth. Mahishi, daughter of Karamba, brother of Ramban undertook a severe penance towards god in order to take revenge on the Devas, who were responsible for the death of her brother. Lord Brahma appeared and offered to confer on Mahishi any boon except that of immortality. Mahishi asked Lord Brahma to bless her with a boon by which nobody, except the son created out of the union of Hari and Haran , (Vishnu and Siva) would be able to kill her. Lord Brahma gave the boon and Mahishi went to Devaloka and started harassing the Devas. Meanwhile, the asura Basmasura had so pleased lord Shiva with his austerities that Shiva gave him a boon of anything he wished. So Basmasura asked for the ability to burn to ashes anything which he placed his hand over. No sooner had Shiva granted this, than Basmasura ran after the god, threatening to turn him to ashes. Shiva called to lord Vishnu for help. He hid himself in a certain tree as Basmasura ran here and there searching for the god. Vishnu became aware of the events, and decided that he would take the female form Mohini, "the Enchanting", and try to trump the asura's powers. When Basmasura saw Vishnu in this form, he was bewitched by her beauty. He earnestly tried to court her. So Vishnu instructed Basmasura to hold his hand over his head, and vow fidelity. With this act, Basmasura was reduced to ashes. Vishnu found Shiva and explained the whole affair to him. Shiva asked if he too could see Vishnu in this female form. When Vishnu appeared thus, Shiva was overcome with passion, and united with "her" Their union resulted in the birth of a handsome child. He came to be known as Shastha. Lord Siva adorned the child's neck with a golden chain and ordered that the child be entrusted to the care of his childless disciple, king Rajasekara of Pandalam. King Rajashekhara, The Wealthy Ruler of Panthalam in Kerala, had no children. His Subjects were worried. If there is no heir to the throne what will become of them when their king dies. People wished he was blessed with a son. A Son, as pious and generous as him. His ambitious Diwan (Prime Minister) however was happy as long as no heir to the throne When King Rajashekara dies the kingdom will certainly become his. The King and The Queen they themselves were in a world of grief coz of not having any little on e to love and take care of. The King who was an ardent Lord Shiva devotee used to pray to the Lord for a Son. While the Queen who was a staunch Lord Vishnu devotee prayed to him. One day King Rajasekara went for hunting in the forest adjoining the banks of river Pamba, along with his men. He started hunting courageously in the dense forest which was a sanctuary for many wild animals. After the hunting was over, King Rajasekara advised his men to take rest and sat there entertaining himself with the sight of the natural greenish beauty and the water-falls of the forest. At that time, he heard a child crying from somewhere in the forest. Surprised, he went round and reached the banks of River Pampa. There he saw a beautiful and brightly-lit child kicking its legs and crying out, and was in a dilemma whether to take the child to that Palace or leave it there itself. While the King was engrossed in his thoughts, a Sanyasi (hermit) appeared before him and told the King that he need not be afraid of the child and to take him to the Palace and that the child belonged to Kshatriya dynasty capable of mitigating all sufferings. The Sanyasi further stated that since the Child had a gold chain around his neck, he shall be called Manikanda and when the child completed twelve years, the King would know his divine history. After uttering these words , the Sanyasi disappeared. The child was none other than the same one born to Lord Vishnu and Lord Shiva. The Sanyasi was none other that Lord Shiva himself. King Rajashekhara took Manikandan home to his queen. Her joy knew no bounds. The mother in her was born. Manikandan was considered as God’s Own Gift. The People were happy. They celebrated the arrival of Manikandan. They too considered Manikandan as God’s gift to them. But again the Diwan didn’t think so as; Manikandan’s arrival had upset all his plans. Manikandan soon grew up into a strong young lad. He was placed under the guidance of an excellent Guru and soon mastered all there was to learn. Guru knew that Maikandan was not an ordinary child. By the time Manikandan’s studies were over, the Guru knew he was a divine child. After completing his education under the Guru, Manikanda went to his Guru for his Ashirwathams, the Guru told him that he already knew that he was a divine power and he was blessed for having been given an opportunity to have Manikandan as a student. The Guru further told Manikandan that he had one request to make and that was that his only son who was blind and dumb should be given vision and speech. Manikandan called the Guru's son and put his hands on his head and immediately Guru's son had his vision and speech. Manikandan told the Guru not to reveal this to anyone and went to the Palace. Manikandan performed many much miracles. The subjects were happy to have such a prince, who would be their next king. Manikandan once even defeated an Arab pirate who had come to make salves of people. He not only defeated the pirate but made him understand the wrong doings he had done and made him his friend. The name of the Arab is Vavar. This shows how Manikandan did not believe in religion as a barrier. Vavar and Manikandan grew into very good friends. Manikandan also had a Christian friend Sebastian / Kochu Kadutha. The People were feeling secure on seeing Manikandan. They regarded Manikandan as their future King. This was getting the Diwan really worried. He needed to get rid of the young boy. In the meanwhile, the Queen gave birth to a male child and the child was named Raja Rajan. King Rajasekara, impressed with the talents of Manikandan, decided to crown him, treating him as his eldest son. He ordered the Diwan to make arrangements for the same. The Diwan hated this and started devising plans to prevent Manikandan from being crowned to the throne and to annihilate him. He tried various methods including poisoning of food, but failed in all these. However, Manikandan's body bore an injury due to these and ordinary physicians could not cure it. Lastly, Lord Shiva disguising himself as a physician, treated Manikandan's injury and cured him. Having failed in all his attempts to kill Manikandan, the Diwan approached the Queen and told her that she had her own son, it was not correct to crown a person who came from the forest. He further told the Queen since Arthasastra itself has justified any misdeed if it was done to extract a good thing, he would suggest that the Queen should pretend as if suffering from severe headache and he would make the physician tell that only a tigress' milk should be brought to cure the Queen and since Manikandan would only go to the forest to bring the milk, he would be in danger from the wild animals and even if Manikandan returned without bringing the tigress' milk, the King's love for him would not be as before. The Queen, became a prey to the Diwan's plot and agreed to do what he told, so that her son could succeed the King to the throne. The Queen, as told by the Diwan, cried out loudly that she was suffering from severe headache and the King, believing this, called the Diwan to bring in the best physicians to treat her. The Physician, brought by the Diwan examined the Queen and told the King that the Queen had been suffering from a dangerous disease and it could be cured only by applying Tigress' milk. The King sent several of his men to the forest for bringing this milk. The King understood that it was an impossible task and wanted his dear Queen to be cured at any cost and offered half of his Kingdom to anybody who brought the Milk. When the King was thinking about this, Manikandan asked him to let him go to the forest promising to bring the milk. However, the King told him that he was awaiting to be crowned to the throne that he was also not of age and hence refused to let him go. Manikandan told the King inspite of his refusal, he had to go lest he would be cursed for not curing the Queen. Since the King persisted in his refusal Manikandan wanted the King to promise to do something he wanted. The King gave the promise and asked him what he wanted and immediately Manikandan asked the king to permit to go to the Forest . The King felt disappointed that he had been tricked and with no other alternative permitted Manikandan to go to the forest. King Rajasekara made arrangements to send a group of his loyal men along with Manikandan, which however was refused by Manikandan on the ground that the tigress might run away seeing the crowd of soldiers. King Rajasekara sent alongwith Manikandan necessary foodstuffs and coconuts with three-eyes, in remembrance of Lord Shiva. The Panchabuthas, sent by Lord Shiva, accompanied Manikandan to Forest . Manikandan set to the forest. As he wandered deeper and deeper into it he came to the domain of Mahishi who lived in that forest of Erumeli . Mahishi attacked Manikandan. They had an immense fight on the banks of river Azutha. Lord Shiva came down to earth on his Ox and tied in near a tree near Azutha now known as Kalaketi. From there he witnessed his son fighting the evil Mahishi. A Fierce Battle ensued. Manikandan got hold of the horns of the Demoness Mahishi and threw her across the banks of the river Azutha on Azutha Mala. She fell dead. Manikandan picked a stone from the river and placed it on her body. From the Body of Mahishi came a beautiful lady (Maalikapurathu Amma). The Lady was actually cursed to become Mahishi. She thanked Manaikandan for relieve her from the curse. She asked Manikandan to marry her. On which Maikandan told that he is a Brahmachari and will be so forever. But the lady persisted Manikadan told her that a temple will be build for him. She will also have a place near by him. And the year when no new pilgrimage comes to the temple that year he will marry her. As Manikandan continued in search of Tigress, Lord Indra the King of Devas appeared before him. He took the form of a tigress and asked Manikandan to mount on him to the city. Manikandan did as he was told. The Devas who had accompanied Indra also turned themselves into tigress and followed into the city. As Manikandan rode into the city on his terrifying mount followed by an equally terrifying retinue the people were in utter disbelief. The news spread to King Rajashekhara, The King rushed out to see this unusual sight was stunned. He remembered the Sanyasi telling him Manikandan turned twelve that day and he heard a divine voice which told him that Manikandan was none other that God Shree Dhramashstha himself. King Rajashekhara ran forward and fell at Manikandan’s feet. He asked Maikandan to send the Tigresses away as his people were terror stricken. Manikandan smiled and the Tigress vanished. King Rajashekhara told Manikandan that as soon as he had left the queen recovered. He also came to know of Diwan and his plan and was ready to punish all of them. On this Manikdandan asked them to be spared as they were the reason which led to his mission of slaying of Mahishi. By saying this Manikandan said he would hence forth lead a life of a Sanyasi and do Twapaswa. King Rajashekhara wanted to build a temple for him. Manikandan took an arrow from his quill and shot it. He asked a temple to be built on the exact location the arrow had fallen. He gave the king special powers to see the arrow. The arrow fell at the summit of the Sabari Hills. He also said the Temple should have Eighteen steps at the eastern side. Saying this Manikandan Vanished. The King began to trek to the top of the mountain and somehow managed to reach the top exact where the arrow had fallen with high difficulties. The King thought he would never be able to achieve to build the temple at such a height. As he stood dazed, Vishwakarma, the divine architect came to his help. Under the guidance of Vishwakarma the magnificent temple was soon completed. King Rajashekhara was thinking about the befitting idol for the temple. Then Lord Vishnu sent Parashurama to the King to carve and install the Idol for Manikandan. Parasurama on the day of Makra Sankaranti installed the Idol in Sabarimala Temple . And thus it was that image Ayyappa as Manikandan carved by the Parusarama in yogamudra with chinmudra on his hands came to be popularly known was sanctified. Meanwhile the wicked Diwan was affilicated by an incurable disease. He once prayed to Lord Ayyappa for forgiveness. He had a dream in which Lord Ayyappa asked him to come to his temple on Sabarimala but entering the shrine only after being cleansing in River Pamba. Rivier Pamba is said to be enlivened by the sprit of Shabari, the devotee of lord Rama. The Diwan wanted no time the next morning he set out for Sabarimala on way the river Pamba. He took a dip in the river and as soon as he came out he was again back to his normal health. River Pamba showed her mercy on the Diwan. He rushed to the shrine to Sabrimala temple chanting Ayyappa, Ayyappa. When he reached the sanctum sanctorum overcome by emotion he fell at the feet of the Idol he burst crying Swamiye Sarnam Ayyappa. And to this day as Pilgrims make their way to the temple of Ayyappa they call out Swamiye Sarnam Ayyappa. The number 18 itself has great significance in Hindu philosophy. There are18 chapters in Bhagavad Gita; there are 18 Puranas; there are 18 battle techniques; Kurukshethra battle lasted for 18 days; Four Vedas, 6 Sutras, 5 Senses and 3 deities add up to 18. There are different interpretations to the significance of the 18 Holy Steps. 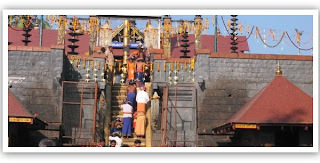 Another belief is that the 18 steps represents the Sabarimala and the 17 other peaks that surround Sabarimala. The 18 Holy steps are the holy pathways for the Jeevaatma to reach the Paramaatma. Jeevaatma has to cross the 18 virtues to merge with paramaatma. The Holy steps 1, 2, 3, 4, and 5 represent the 5 Panjendriams: (Smell, Hearing, Sight, Taste and Touch). The Holy steps 6, 7, 8, 9, 10, 11, 12, and 13 represent the 8 Ashtaragas: Kamam, Krodham, Lobham, Moham, Madam, Matsaryam, Thanbha and Asuya. The Holy steps 14, 15 and 16 represent 3 Gunas: Thamas, Rajas and Satva. The Holy step 17 represents Vidya and the Holy step 18 represents Avidya. By observing stringent vruthams (austerities), the Ayyappa devotees called Ayyappas and Malikappurams, purify their body, mind and intellect and achieve the ultimate sanctity to make pilgrimage to Sabarimala carrying on their head the Irumudi containing the Pooja items, to climb the 18 holy steps and have the Darsan of Lord Ayyappa. Pilgrimage to Sabarimala begins from the 1st of Vrichikam, a Malayalam month coming in the middle of November (probably between 14-16). The most important day for Ayyappan is Makarasankranthi Day, which is the 1st of Makara (a month of the Malayalam calendar). This day will fall between January 14-16. Currently millions of devotees come from all parts of India to Sabarimala for a glimpse of Lord Ayyappan, having undertaken 41 days of Vratham (austerities). On Makarsankranth, every year without fail, miraculous events occur. Firstly as the jewels (Thiruvaabaranam) of the Lord are transported from the Old Pandalam Palace to Sabarimala, a Krishnaparanth (holy eagle) circles above the precious cargo, like a protector. This rare eagle is rarely seen in the midst of people for a long period of time, yet the auspicious bird follows the Thiruvaabaranam procession, finally circling above Sanithanam at Shabarimala nine times as it pays its respects to Lord Ayyappan. During this time, there is not a single star in the sky expect for a special Nakshatram. As the beautiful jewels are placed on the golden body of the Lord within the temple, the several hundred thousand devotees outside, crammed into any available free space, chant "Swamiye Sharanam Ayyappa". When the jewels are finally all adorned on the Lord, the Nakshatram in the sky miraculously disappears, as all the Devas and Celestial beings leave the sky to get a glimpse of the Lord in all his spleandour. Within moments of the Lord being adorned with the Thiruvabaranam, an effulgence appears in the opposite hills of Shabarimala, appearing 3 times. The entire hillside reverberates with the chant "Swamiye Sharanam Ayyappa" as the devotees witness this auspicious sight, as the Devas and Celestial Rishis arrive at Shabarimala as an effulgence. These auspicious sights are different forms of the Lord Himself appearing. The devotees then climb the 18 holy gold steps to arrive at the Sanidhanam where they finally get a glimpse of the Lord as Himself, in all beauty, Manikanta Shri Dharmasastha, adorned with jewels. It is believed that if one witnesses these events after having undertaken 41 days of severe austerities (Vratham), one can attain Moksha. This is why Ayyappan is also known as Kaliyugavaradhana, since He can help us to attain Moksha in this difficult age of Kaliyuga, the Age of Hypocrisy and Violence. The austerities (Vrutham) starts on the first day of the Malayalam month Vrichikam ( November 14/15/16 ) for those devotees who intend to worship Lord Ayyappa on Mandala Pooja Day( around 25th December ) or Makara Sankranti day (around Jan 14th). "Makara Sankranti" day is the most auspicious day at Sabarimala and " Mandala Pooja day " is considered as second most auspicious day. Nowdays the temple is open to devotees on 1st day of each Malayalam month and other kerala festival days such as "Vishu", "Thiru Onam", etc. However 41 days minimum vrutham is necessary before the day of Pilgrimage to Sabarimala as per the conditions of the pilgrimage. The vrutham starts from the day of wearing of "Thulasi Mala" (garland) or "Rudraksha Mala" with the locket of Lord Ayyappa. The mala is to be accepted from a temple Priest or Guru Swami /Periya Swami (The devotee who has visited the Sabarimala Temple several times and who can guide the other devotees in all matters relating to Sabarimala pilgrimage) after the mala is duly sanctified in a temple/ or pooja room. A "Dakshina" is to be given to the priest/Guru Swami/ Periya Swami concerned.After wearing the "Mala" the devotee is called as "Ayyappan" or "Swami"( in the name of Lord Ayyappa) till the completion of his pilgrimage and removal of Mala thereafter. The eligible female( aged between 1 and 9 and above 50 years) devotees are called as "Malikapuram"( The Shakti of Lord Ayyappa). During the period of Vrutham utmost care should be taken by each devotee to keep their mind and body clean,pure and balanced. The devotee is expected to live like "sadhu", "Yogi" and his action,word,thought should not under any circumstances hurt the feelings of the others. The devotee should avoid all worldly pleasure and avoid taking alcohol,tobacco and non-vegetarian food. They are also not expected to cut hair and nails a shave. Black / dark blue dhoti and shirt is the proper dress for the vrutham. Wearing Chappal, Shoes are not allowed as per traditional rule of the Vrutham. Absolute Bramacharya during the period is essential without which no devotee should go to Sabarimala Temple . The devotee is expected to pray in the morning and evening after taking bath. Before each meal devotee should pray and take the meal as "Prasadam" of Lord Ayyappa. Without proper Vrutham Pilgrimage to Sabarimala is not at all advisable. The mental satisfaction of the pilgrimage can be attained only through the proper Vrutham.May the Lord Ayyappa help everybody to follow the rule of traditional Vrutham for theattainment of salvation of the soul. Iru-Mudi The Two Bundles (Of Coconuts, Rice, Ghee Filled Coconut For Abhishekam A Devotee Carries). Devotees Carrying The IRU-MUDI And Who Have Observed The Vratha Are Fit To Climb The 18 Steps. Black Dress Denotes Humility & Simplicity. Blue Dress Denotes Infinity. Saffron Dress Denotes Sacrifice. lrumudi is the only travelling kit which a pilgrim carries on his head during the pilgrimage. Only those who observe fasting for 41 days are allowed to carry it. Without the Irumudi one is not allowed to step onto the holy 18 steps at the Sannidhanam. This bag is in two compartments - the Munmudi (the front part) and the Pinmudi (the back part) & the opening at centre. The front portion is reserved for keeping all the puja articles and offerings to the deity while the rear part is meant to hold the pilgrims personal requirements for the journey. Coconut filled with ghee for Abhishekam (bathing the idol of the Lord) + Coconut (vidalai thengai) 2 to 4 nos. Jaggery (achuvellam), Cashew, Raisins, Dry ginger, Poha (thin & thick variety), Cardamoms, Dates, Honey, Avil ( beaten rice), Kadhi Chakkar Dried turmeric tubers, Turmeric powder, Blouse piece, Kumkum, Vibhooti, Sandal paste, Sambarani, Camphor, Agarbathi (Incense stick), Rosewater, Lemon, Rice and Dal for offering. Coconut for ghee Abhishekam : Well before the Kettunira time, select a medium size coconut. Clean and polish the outer shell using a polishing paper. With a pointed instrument, open one eye of the coconut and empty the coconut water. Close it with a cork of correct size. The coconut is now in readiness for the Kettunira. Some snacks which one may require now and then during the trip and other raw materials for food items to be prepared during the journey. And pulses and rice needed for cooking can be included in Pinmudi Saranam Ayyappa ! The important thing to know is that in lord AYYAPPA’S temple there is no restriction for any person following any religion. That is to say Hindus, Christians and Muslims also come there, and are blessed by lord AYYAPPA. To the south-west of the main temple is the shrine of Lord Ganapati, known as Kannimula Ganapati. The special offering to this deity is Ganapati homan; and there used to be a large homakunda in front of the shrine, which burned constantly, fed by the coconut shells thrown by the devotees, after offering the ghee. As the coconut shells are consumed by the fire, the sins of the devotees are believed to be cleansed. Due to the growing crowds in the temple, the homakunda has now been shifted to a location below the temple. About a 100 metres away is the shrine of Malikappurathamma. En route to the shrine is the temple tank, Bhasma Kulam, in which hundreds of devotees take a holy bath in memory of the tapaswini Sabari who entered a fire to end her mortal life. It is after her that the peak is named Sabarimala On account of the number of people who bathe in the tank, the water is frequently drained out and refilled with fresh water. Situated on a small hillock, the Malikappurathamma temple houses the shrines of the Devi and Kaduthaswamy. Devotees also worship a trident and lamp here, and offer coconuts. The coconuts are not broken, however, but are just rolled on the ground around the temple. To the left of this temple are the shrines of the snake god and goddess, Nagaraja and Nagayakshi. Here, tribals beat on drums, play stringed instruments and sing sarppa pattu to protect devotees and their progeny from the harmful effects of snakebites. At the foot of the Patinettampadi are the two shrines of Kaduthaswamy and Karuppaswamy, who stand like dwarapalakas or guardians of the holy steps, to ensure that they are not polluted by those who tread on them without fulfilling the rigid austerities required of them. They are also believed to protect the devotees from the evil spirits of the forests. According to legend, Kadutha was a great warrior who helped the Pandalam king defeat the armies of Udayanan and other enemies. When the king came to Sabarimalai to reconstruct the temple, Kadutha came with him to protect him. Ultimately, he became so attached to Ayyappa that he decided to spend the rest of his days with his Lord. Also near the Patinettampadi is the shrine of the Muslim Vavurswami. 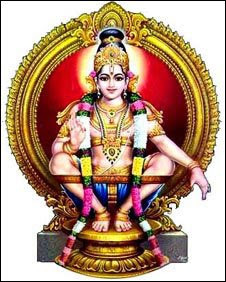 While there are several accounts of identity of Vavur, it is generally believed that he was a warrior who was defeated and subdued by Ayyappa, and later became a close associate. It is believed that Lord Ayyappa himself instructed the Pandalam king to build a mosque for Vavur at Erumeli and a shrine at Sabarimalai. I take refuge in thee God. My refuge is in you Ayyappa. May the Hari Hara Putran bless all his devotees and non-devotees with good health and wisdom. 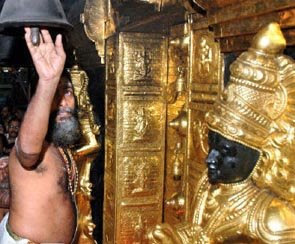 Swamiye Saranam Ayappa. Hari Hara Putra Saranam Ayappa.